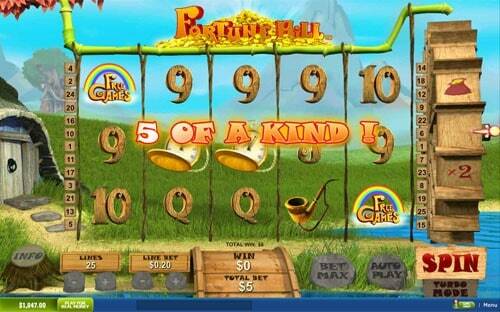 Fortune Hill is a 5 reel and 25 payline online slot game by Playtech. The game has a fairytale theme and the game starts by playing an introduction scene that gives you an introduction to all the game's characters. The graphics are exquisitely done in a cutesy 3-D style. The reels themselves are transparent and in the background there is a lake, a grassy field and tall, rocky mountains. There is a large water wheel on the right of the reels that comes into play during the game. Attention has been paid to the symbols, where even the playing card symbols seem to be carved out of wood. Other reel symbols include fantasy characters and magical trinkets. Wizard's Hat - Awards players with 3 free re-spins, extra Wild Symbols and frozen reels. Money Bag - For this icon players will be given a random cash prize with a limit of u to 6x their bet. Wand - Rewards players with a random cash prize or expanding Wild Symbols on reels 2 and 4. The Magic mushroom Bonus Feature is activated by landing Magic Mushroom symbols on reels 1, 3 and 5 simultaneously. Players will be taken to a new screen where they will be presented with 12 growing Mushrooms, all with prizes attached. Players will need to keep picking Mushrooms until they uncover the one that says 'Collect'. Your prizes will now be added up and the round will end. 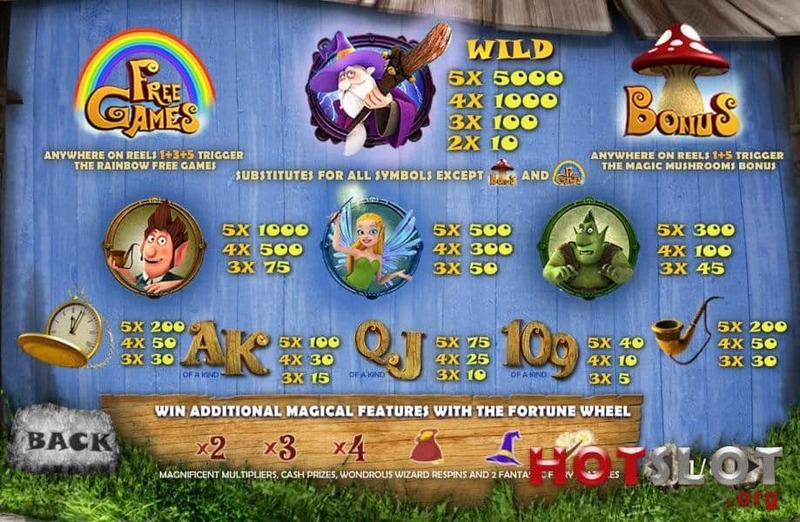 The Rainbow Free Spins will be activated when players land Rainbow Scatter symbols on reels 1, 3 and 5. Players will automatically be awarded with 8 free spins. The Water Wheel changes in this round to only award free spins of 2, 3, 4 and 8 , leading to potentially even more free spins in the round. The Wild Symbol in this game is the icon of the Wizard. This symbol has the power to replace all the other symbols in the game except for the Rainbow Scatter and the Mushroom Bonus symbols. The Wild also acts as an individual symbol and is Fortune Hill's most valuable symbol. If players can land a winning combination of 5 Wizard Wilds they will have won their bet multiplied by 5000x. Fortune Hills is Playtech game that is full of magic and whimsy. The graphics are of exceptional quality and definitely add value to the game. The features are unique, especially the Water Wheel feature that we haven't seen before and makes for interesting game-play. Although this slot is feature rich and has a variety of bonus features, it is still easy and simple to play.